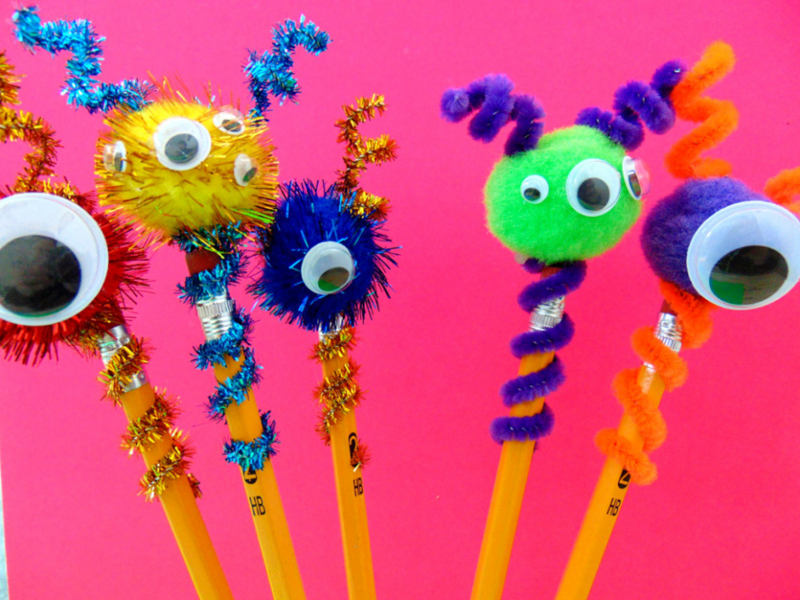 Make homework a little more fun with these Pom Pom Monsters Pencil Toppers! 1. First you’ll want to choose a pipe cleaner and cut the pipe cleaner in half. Keep one half and cut the other in half. You should now have 3 pieces of pipe cleaner. 2. Using the longest piece of pipe cleaner, twist it around your pencil. Remove spiral from pencil. Pick out a pom pom and glue to the top of the pipe cleaner spiral. Now you get to decorate your little pencil topper monsters. 3. 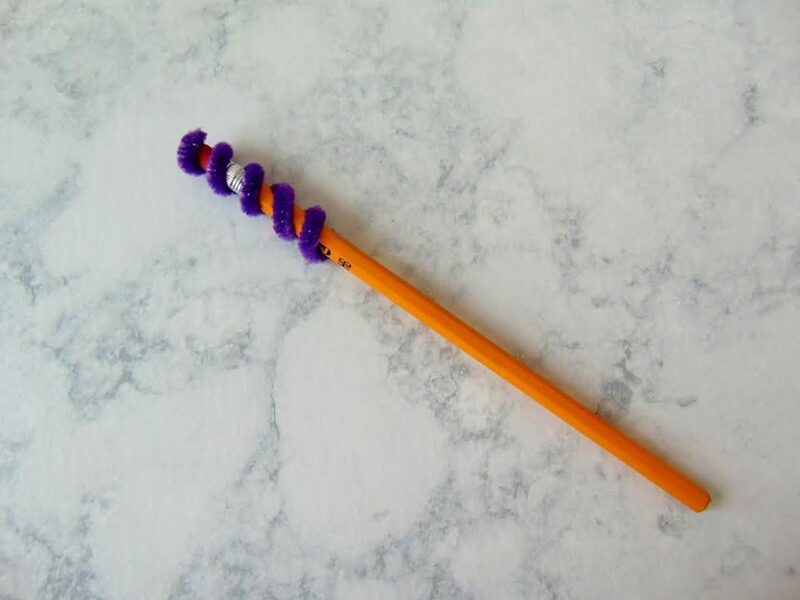 Twist the 2 pieces of pipe cleaner you have left around your pencil and remove the spirals. Glue these onto the top of your pom pom as if they were horns. Glue googly eyes all over the front of the pom pom. 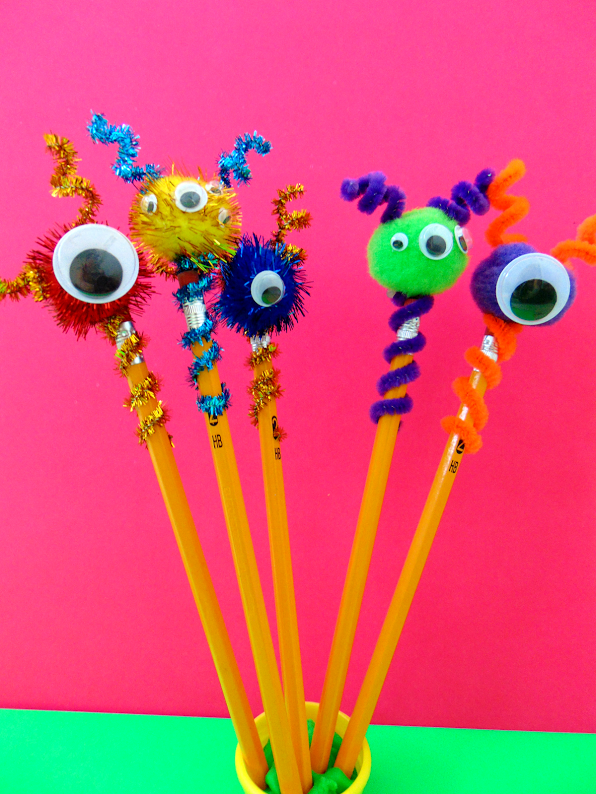 Your monster pencil toppers are ready! 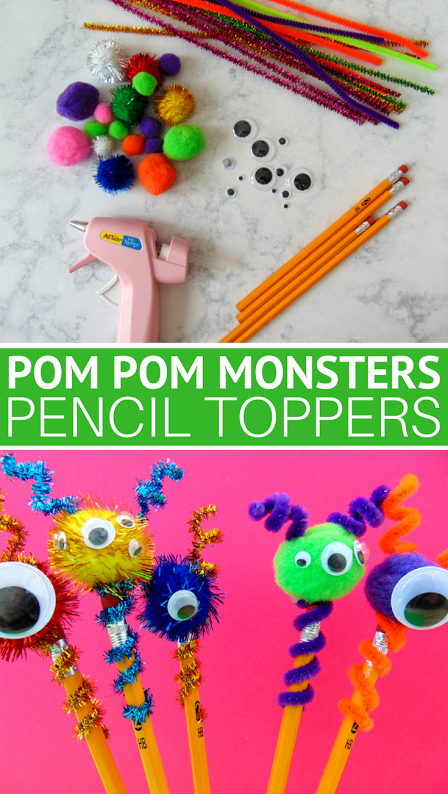 Mix and match your pom poms & pipe cleaners to create all different monsters. Aren’t these Pom Pom Monsters Pencil Toppers adorable? You can make your own with just a few supplies that you can grab at the dollar store. It’s easy to get creative with them and come up with your own monsters – the possibilities are endless. This is a really nice DIY. Thanks for sharing the method. My kids will love it. I absolutely see how these adorable toppers can make homework a happy time… I love this idea, and it is great for any age too! Joyful Savings recently posted: CashBack Like a BOSS – A list you don’t want to miss! My daughter would LOVE this! I’m going to show the post to her. I think we have most of these things in the house already. Those are so cute! Homework can be so boring. Anything we can do to make it more fun is always a plus. Those are super cute. I used to make things like this when I was younger. It’s nice to have something that’s unique and fun. These are the cutest little monsters I’ve ever seen! I can definitely see how these pencil toppers will encourage kids to do their homework. So adorable! These are so cute! I know my daughters would not only love making these but would love showing them off to their friends too! Those pencil toppers are super cute. What a great craft idea, I remember making some similar things when I was young and enjoying it. How adorable and cute are these?! I will be sharing this with my sister in-law for my niece. She will be so thrilled to make them. Oh these are so cute! The kids would love to have pencils that look so pretty. This is going to make them sit and do their homework because they have fun pencils to use! They are so cute!! This idea is amazing! Cute! What a great way to fancy up some pencils. Seems very budget-friendly too which is nice. Wow. This is such a simple craft to make with inexpensive materials! My granddaughter would love to have her pencils glammed up like this! These are really cute pencil toppers. Kids would surely love them everytime they use it. These pencil toppers are super cute and fun to make with the kids! It looks like such a simple DIY too! What a fun and creative way to bring life to your boring school pencil. Another idea is it could be a creative decoration at a party and even a party favor . Those are so adorable, and such a fun way to brighten up homework time a bit! They look super easy to make! These are stinking adorable. My girls would love this activity and any excuse to craft instead of doing schoolwork! I love that this is super economical. Those are so cute! I will have to see if my son would be interested in making those. Those are so cute! I will have to see if my son would be interested in making those for at home. Oh my! These are so adorable and such a great idea! I bet school-age kids will love having these on their pencils! Totally agree about homework. It’s such a battle with my little one. Those pencils are so cute. These are too cute. I remember making pompom monster when I was in middle school. I think this could be a craft we use during our children’s church. These are so adorable! Heck! I think I may make these and keep a few for myself! These are so cute. 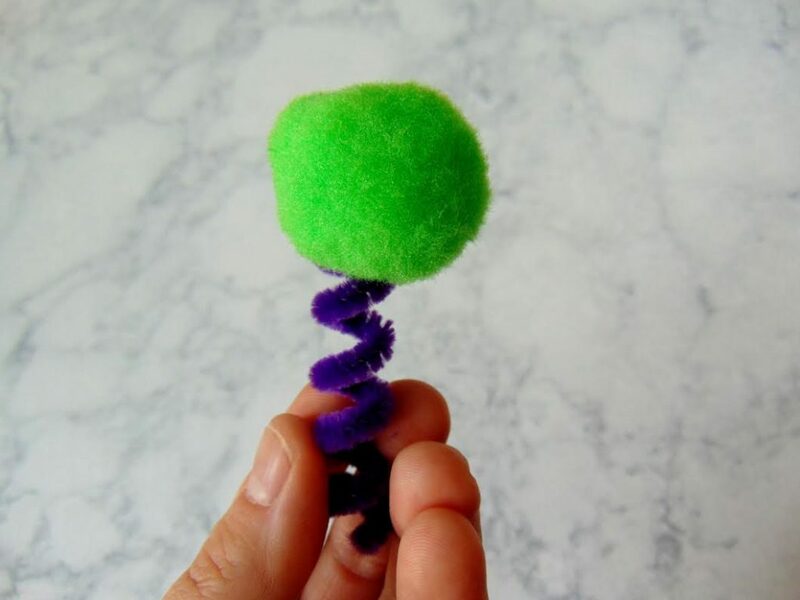 My kids used to love making crafts with Pom poms! These are too adorable, plus I love how effortlessly easy they’re to make! I know that my kids would love this, too. They are super cute. Maybe if I had some of these I wouldn’t forget that my pencil is in my ear. oh-em-gee! These are too cute! As a teacher, I am totally going to use this as a filler activity one day and the students will LOVE it! Cant wait to try it with them! Hmmm..am jealous now. I think ill do this with my pen. This must be a cute stress-reliever whenever I will write something on my planner. This is such a cute idea. My kids would have a lot of fun with these. How cute! My daughter is doing a project on Mars right now. All she wants to do is make a poster, and I’m trying so hard to understand that she doesn’t want to spend hours on Pinterest planning something more show-y. Maybe she’ll oblige me and we can make these monsters and call them Martians! Those are super cute and easy enough to make. I love the idea of doing this for younger kids who may lose their pencils often or just want something “fun” to do homework with! This is such a fun craft. I know my kids would love to mak these. Theyre so cute. These are so cute! I’ll have to do this craft with my little sister the next time I babysit. This is exactly the kind of thing she would love. wow this is so cute! I love this! Such a great idea especially for rainy days. Aww, these are cute. I think the kids would have a blast coming up with interesting monsters! Oh my gosh! Those are too cute! I need some for my pencils. Those are so fun!! My daughter would love making these and playing with them. We’ve got all the stuff in our craft bin, I know what she’s gonna do for art tomorrow! What a fun idea! My nieces would love to do this! I love to spend afternoons creating fun littler crafts like this with the kiddos. So cute! Very cute craft. I have some nieces and nephews who will be over for Easter and will have to keep them busy with this craft. This would make school so much more fun- or at least homework! I love little crafts like this for kids. It might get them excited! I think it’s a lovely idea! It definitely makes the pencils look more fun. Not to mention, the kids will enjoy making these! I can’t wait to show my daughter! Pipe cleaners are so great for crafts. I have used them for making Truffula trees for a craft after doing story time with The Lorax with the kids at the library. Now arent these fun. I would make these just because so cute. My mommy never had time to make these for me but she always got me the cutest pencils. That’s why I’m always writing with a pencil instead of a pen. Awww what a cute and affordable DIY project! 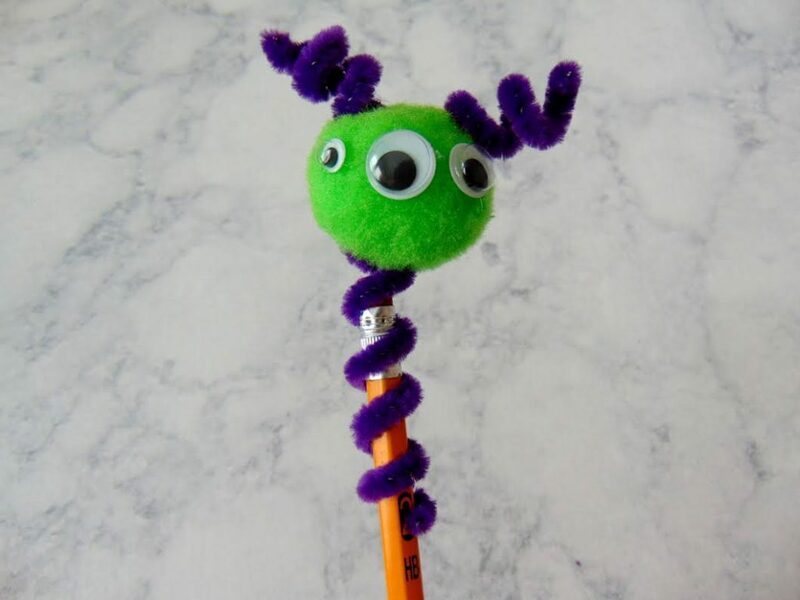 I remember how cool it was to have a unique pencil topper in school. You wanted everyone to see and it did make doing your work more fun. I love it! It’s easy and it’s fun! And you can make all sorts of designs as well. It’s a lovely activity for the kids! It’s nice to make this with the kids, I’m pretty sure they’re going to be more excited to do their homework when they have pencil toppers like this! It’s a fun idea! This is a really cute idea! I should make these with my kids over spring break. They would love them! No one will say NO for a good pencil! This could be a good giveaway too. These are adorable! Very cute and fun for the kids to make. My 9 year old would love these!! Very creative and colorful too! That is an interesting perspective you have on the whole homework thing. When you think of it, it is kind of true – why overwork children even more at home on what they have been doing all day at school? Those pencil toppers are works of art and so cute for a kid to bring to school. I even think my daughter in high school might like them. I remember we always buy pens with cute characters. I think this is a cute idea and not so expensive! This is so adorable! Such a fun craft for kids!! These are super fun!!! My kids would love to make these for their classmates! Thank you for the easy DIY! Oh my goodness. Talk about cute! These are adorable and would be so fun for my kiddos for homeschooling! How fun. I bet my son’s teacher would like to make these in the classroom if I donated supplies. They’re really cute! These really are very adorable! THis is a perfect little craft to keep little hands busy during Spring Break or the summer. I used to RAVE about those fancy topped pencils when I was in school. These are even cuter than those! For some reason, my kids find school SO much more interesting with neat pencils. I have no doubt they would love these. I love how creative kids can get with their imagination on these. The sky is the limit and it makes it their own. This looks like a cute and fun DIY! I know my son is going to love this diy. Very creative idea! This is such a cute idea. I have all the supplies I need to make some with the kids this weekend. I am sure they will be a hit. These are so cute. You can even take these to school decorated this way. Everyone would love them! These monster pencil toppers are so cute! And you may have the supplies laying around your house already in your craft box! Great DIY ! Omg how cute are these pencil toppers?! I bet my daughter would love to make these with me. Oh these are so cute!! And easy to make too. My daughter would enjoy making this. What an adorable craft! My girls will love this – and I love that it is easy enough that they can do it without any extra Mom assistance. I love these! Looks easy enough for my kindergartner to do mostly by himself. Aww these are so cute! I love how easy they are to make and I love that I actually have these fuzzy twisties! I” have to try this soon! These are so sweet! I love these as a cute craft idea for the kids, especially over easter! Those are so cute! They’re perfect for back to school and they seem really easy too! What a cute and fun idea. My son would like to make this and it would be another chance to spend time together! I absolutely like it! These Pom Pom Monsters Pencil Toppers are super cute and super easy to make. I’m sure kids will be delighted for these. those are so cute. i bet my kids would love doing this one weekend. will have to try it. Oh my gosh, these are so cute! I’m tempted to make some for myself, lol! Very cute and simple idea for little AND big kids too. Oh my goodness! These are adorable. I love simple and easy crafts for kids. So cute. Dude, we totally did this when I was a kid and I thought it was the best thing ever. We did the Rudolph ones at Christmas. Haha.